It has already been proven that AEGEE-Alicante can serve as an example to be an awesome local. They manage to organise a lot of local activities, their Summer University was the 2nd ranked last year and they have a lot of members involved in many AEGEE-Europe bodies. Besides that, their contribution to the Action Agenda, acquiring certificates with ECTS recognition (European Credit Transfer and Accumulation System, creditation for academic competences in Europe) from the University of Alicante, has made them become ACTive Local of the Month of February. We interviewed Melissa Carreres, President of the antenna and one of the main executors of the successful Buddy Program. The AEGEEan: First of all, congratulations! You contributed to get certificates for mentors for your Buddy Program, which is the reason you were chosen as ACTive Local of the Month. Can you tell us more about these certificates? Melissa: Many thanks! This recognition makes us feel very happy, because this program has lots of work behind it. This is the second year we are doing the Buddy Program in Alicante; we organise a new edition every semester. As you may know, it’s a mentorship program which aim is to provide support to international students by pairing them with local students who help them to settle in during their stay in Alicante. This program is offered to all students, not just AEGEE members. We thought it would be great if we could recognise somehow the great labour of integration done by more than 500 students from the university. We are currently working on the certificates of the previous and the present edition and we will deliver them soon. We will do the same for the organisers whose labour has been the key of success. But what is more, we’ve got a learning agreement with the university and they will recognise up to 1 ECTS for buddies and 2 ECTS for organisers, which is more than a really great achievement for us. Nevertheless, students are interested in the program even without knowing about this recognition, but of course, this makes the Buddy Program even sexier! Your Buddy Program is an outstanding example of great cooperation with the university. Can you tell us a bit about it? How did you achieve this level of cooperation? It was an idea we had for a long time. We heard that other antennae were doing it and we wanted to bring it to our university. Two years ago, Pablo Hernández, who then was our President, contacted the International Mobility department and they showed interest in the program. After several meetings and although the setting was not easy at all, we could finally start with it. At first, as a test, we started with a small group of international student. It went pretty well, so after gaining the International Mobility department’s trust, they decided to open the program to everyone (Erasmus and international students). In this current edition, at least 80% of the incoming students have applied for the program. This program has grown a lot and the results we are getting are amazing. We are very happy and the mobility department is giving us a lot of support. Since we started, they have asked us to present the programme in the welcome talks for International Students, they have printed PR materials such as posters and stickers and also, as you know, we have got the agreement to certificate and recognise the skills and work of the participants! Also, we have a good relationship with ESN, so besides the Buddy Program, we did another project with them: a Guide for International Students. This guide collects lots of useful tips for foreign students who comes to Alicante for the first time. The International Mobility department has printed lots of them and has delivered it to all the internationals students. Are you willing to collaborate by spreading this project to help other antennae to do the same? La Tripulación, the NetCom team of our area, thought it would be useful for other antennae and asked us to develop a guide about the program with all the organisational details, so other AEGEEans could have all the information. We agree that it can be beneficial for other antennae, specially for those who are working on establishing good relationships with their university. In our case, it has been one of the biggest projects we have done so far and it has brought many benefits. We have the support and a good relationship with the university, it’s good for member recruitment, very different from the SU campaigns, it has given us visibility and recognition through the university community and in addition, some people who have joined AEGEE because of the program, seem to be potential active members. Why do you think the Action Agenda is important to the Network, and what would you say to another local that is thinking about organising something related to the Action Agenda? What makes AEGEE different from other associations is just that. The Action Agenda is about what we want to achieve in AEGEE and it’s something every antennae should include in their Activity Plan. Without it, AEGEE would lose its essence. We are the ones who decide during the EPM what we will do, so why not contribute to something we are trying to reach as organisation? Organising an activity related to the Action Agenda doesn’t mean it should be a complicated activity. Sometimes it happens that you are organising a fun activity and you don’t realise you are actually contributing to the Action Agenda! Are you planning to organise more activities related to the Strategic Plan and Action Agenda? We have already started with our SU campaign, which is going to take almost all our time and energy but we like to organise other activities, especially if they contribute to the SP and AA. In fact, next week, we are doing an exchange with AEGEE-Eindhoven. They are coming to Alicante and we will show them around and visit some special places. Since the 22nd of March is the World Water Day, we will do some activities related to it with them. Regarding the Buddy program, the next milestone we want to achieve is for participants of the Buddy Program to get preference (or extra points) in the application process of the Erasmus program. We know that it has been done in some Universities, so hopefully, we will get it too. Nevertheless, we will keep on promoting awareness among our members and participating in benefic campaigns as we have done so far, like for example, the last Blood Donation Marathon or the bike marathon against the climate change and the melting of the polar ice caps. 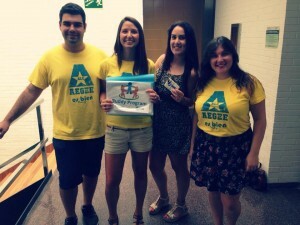 AEGEE-Alicante has certainly shown to the Network that it can be an example to other locals, what would you say to other locals that want to be as awesome as you? We don’t think we are that awesome. There are a lot of antennae that are doing a great job. Every antenna works in a different way. We have found what really works for us but there is always room for improvement. We try to make the most of all the resources we have. It’s very important to keep a mix of experienced members and new members, so we make sure the “legacy” keeps going on. Also, having members involved in the European level helps us to be updated with everything that is going on and indirectly, helps us to be involved in it. There isn’t any secret formula, just, whatever you do, do it with passion!